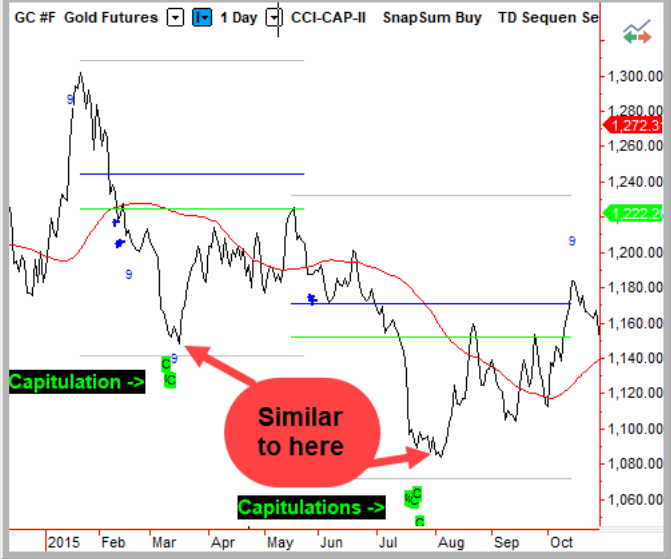 The Downside Capitulation alerts in gold of July 17th-19th have been followed by a small bounce, capped with closes just under $1232. Last week saw new closing lows at $1205. 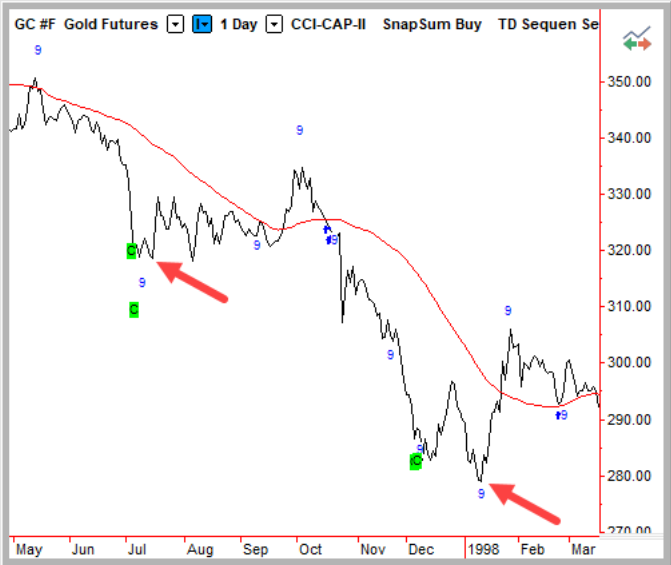 This continues to have the makings of a classic undercut of support and a Wyckoff ‘Spring’ bottom (see 2016, 2015 and 1998 examples). Any daily close above $1232 should be followed by an initial rally that tests the 55-day simple moving average (currently $1262) within three weeks. 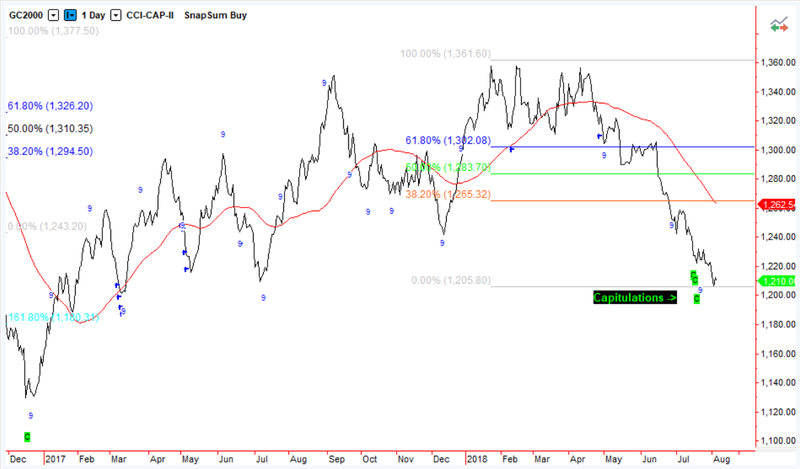 There is the outside chance of a secondary rally from there that retraces 50% or 62% of the decline from $1360. While the US Dollar Index has risen by 7% since March, gold has dropped by 11%. 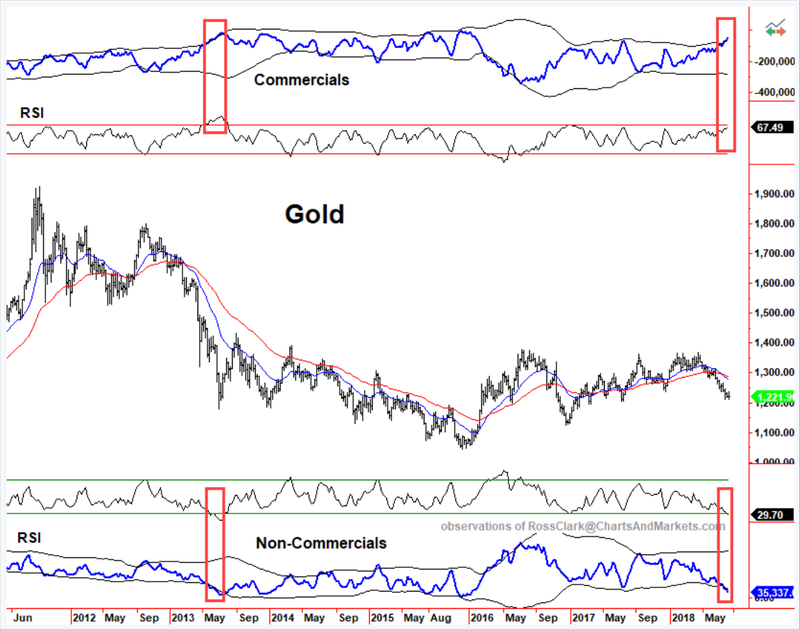 Gold’s closest correlation with a currency is the Chinese Yuan. The US Dollar/Chinese Yuan has moved 10.9% since the March. 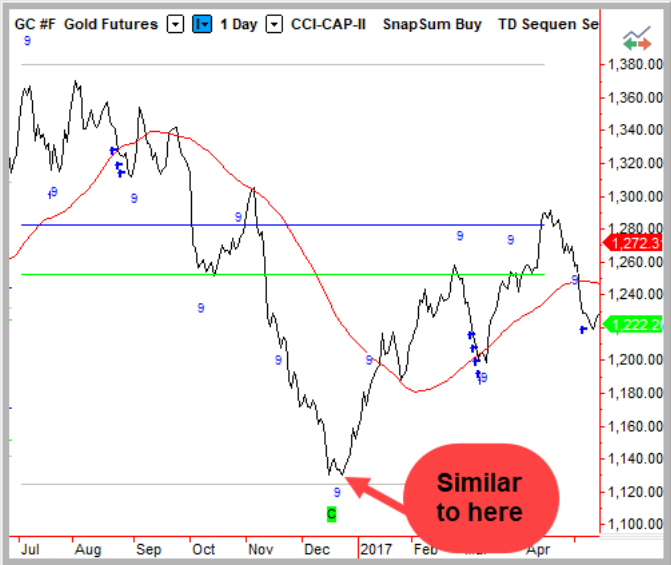 Both gold and the Yuan are testing the levels last seen in the middle of 2017. Initial signs of a change in direction will be an hourly gold close above $1219 and the Dollar/Yuan below 6.83. To confirm a significant upside reversal of gold through resistance ($1232) we would like to see it confirmed with a decline in the Dollar/ Yuan below 6.77. Last week the Commitment of Traders data from the CFTC showed a continuation in the steady decline in net speculative long positions and net short commercial positions since January. We consider the data to be important once the readings extend beyond the 50-week Bollinger Bands and have an RSI outside of 65/35. They are now in that territory and set up for a counter-trend rally once a fundamental catalyst triggers an upside price reversal. Opinions in this report are solely those of the author. The information herein was obtained from various sources; however, we do not guarantee its accuracy or completeness. This research report is prepared for general circulation and is circulated for general information only. It does not have regard to the specific investment objectives, financial situation, and the needs regarding the appropriateness of investing in any securities or investment strategies discussed or recommended in this report and should understand that statements regarding future prospects may not be realized. Investors should note that income from such securities, if any, may fluctuate and that each security’s price or value may rise or fall. Accordingly, investors may receive back less than originally invested. Past performance is not necessarily a guide to future performance. Neither the information nor any opinion expressed constitutes an offer to buy or sell any securities or options or futures contracts. Foreign currency rates of exchange may adversely affect the value, price or income of any security or related investment mentioned in this report. In addition, investors in securities such as ADRs, whose values are influenced by the currency of the underlying security, effectively assume currency risk. Moreover, from time to time, members of the Charts and Markets team may be long or short positions discussed in our publications.